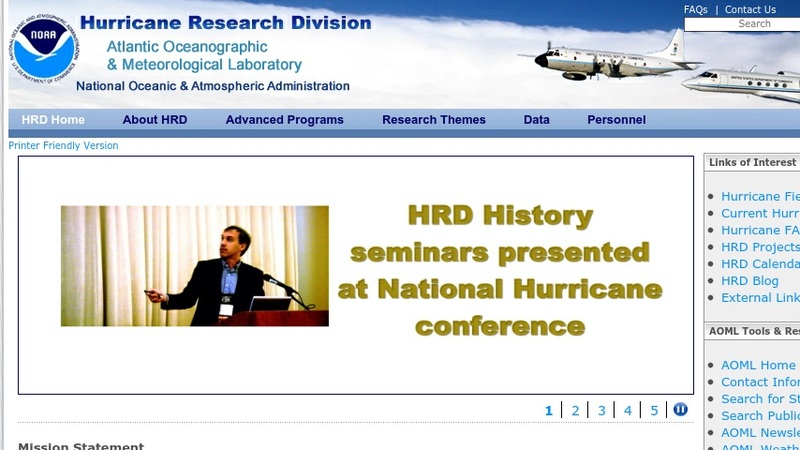 The Atlantic Oceanographic and Meteorological Laboratory's (AOML) Hurricane Research Division (HRD) discusses its endeavors to better understand the physical aspects of hurricanes and to improve the forecasts of hurricanes and tropical meteorological systems. Researchers can find information on the field program Atlantic and East Pacific hurricane seasons since 1997. The site supplies the objectives, station documentation, accomplishments and additional information on the numerous projects for the Hurricane Track Forecasting, Hurricane Intensity Change, Climate Variation, and Hurricane Impacts groups. Residents in areas potentially affected by hurricanes can find hurricane awareness materials, current weather conditions, outlooks, and information on shutters. This site is also reviewed in the June 10, 2005 _NSDL Physical Sciences Report_.